I've been holding a few ideas for paintings and multiple originals (aka prints) in the back of my mind for years now, just hoping for a little time on my hands. Maybe it's only a phase I'm going through – afterall, I've been thinking and reading about aging a lot lately – but those unbirthed works have started calling to me. When I begin making marks for myself again, it would be nice to get some feedback from others who choose visual communication when words aren't enough. Unfortunately, I've been out of touch with CU's blossoming art community for a long while now. Typically the only way I know what's going on is through my 40 North/88 West membership, so it's been well worth the annual fee I pay. Jenny and I first met in grad school when we were working on Art Education degrees. Our advisor often used our polar philosophies on art ed issues to stir up class debates. After grad school, she and I headed in very different directions, only occasionally running into each other at openings where we would catch up on the soundbites of each other's lives. And last night, with a warm hug, she graciously vanquished any sheepishness I felt about going to the first crit I've been to since school. Presenting your work in public is a scary thing. I once told a writer friend that it was like "ripping open my chest and saying, 'here's what makes me tick – whaddya think?'" Presenting your work to other artists can be even worse. But last night I was very impressed with the work presented, and with the supportive and constructive comments by a sensitive group. During the crit, I invariably liked the works even more after listening to the artists describe their motivations and stumbling blocks. I unexpectedly fell in love with a work in pinks and greens from a set of paintings out of Kim Curtis' Landscapes – so much so that I was willing to pull out my checkbook right then. It wasn't exactly the response I thought I'd have to an art crit, but I'm looking forward to visiting Kim's studio soon – and to the next crit! 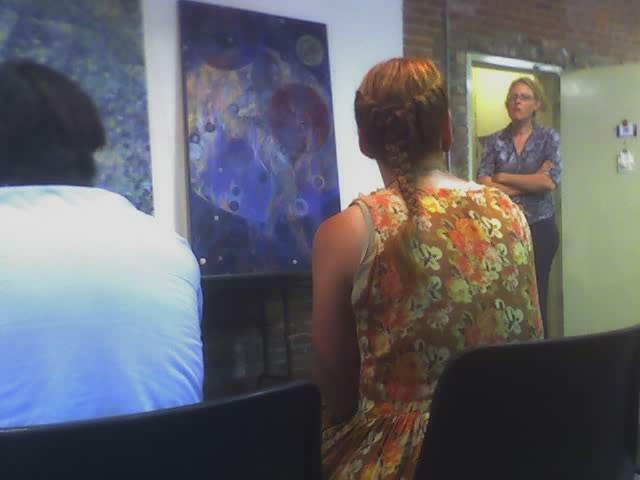 Sandra Ahten discusses her 3 most recent paintings from an upcoming series of 12. On the moblog I set up Friday, you'll see photos of Sophie in a veterinary ER clinic. Brad and I drove to Chicago Friday night to spend Mother's Day weekend with Jolie, who flew in from NYC. We had a great time on Saturday, and I documented some of the highlights in my Dispatches from the Field. Early Saturday and Sunday mornings, Sophie and I walked along the river across from Marina City (image right: Sophie poses during our morning walk on Saturday). However, during the morning walk on Sunday, our weekend took a dark turn. While I was looking across the river to the Chicago Tribune building, Sophie jumped up on a seat built into the wall and from there hopped right up to the top of the wall, where I suppose she expected to find another flat place to sit. Instead, the wall was rounded on top, and hid a 15- to 20-foot drop to a sidewalk below. I screamed as I saw her go down. It took me a slow-motion minute to get to her. She called out to me 4 or 5 times as I was running around to a ramp down. When I got to her, she was struggling unsuccessfully to stand. I held her still and called Brad, who was sleeping back in the hotel. While we waited, another tourist who'd seen the frightening incident ran to our aid. She helped me stand while cradling Sophie, and she answered my cell phone when Brad called back – I wish I'd gotten her name to thank her. Brad and Jolie had gotten an emergency vet's address from the helpful concierge at the pet-friendly House of Blues Hotel. After finding us, Brad and Jolie hailed a cab, and we arrived at the vet's 10 minutes later. By then, Sophie's right eye was closed and her pupils were different sizes. X-rays showed that she hadn't broken anything, but she had some air between her heart and sternum. She spent the next 21 hours at the clinic, on fluids and under observation. I spent Mother's Day sobbing. After leaving Jolie at Midway for a 6am flight this morning, Brad and I picked up Sophie. She was so happy to see me, she jumped from the crate 4' up – the vet and I caught her just in time! Her gait is still a little unsteady, and her right eye is a bit swollen, but she seems to be doing pretty well considering how hard she'd gotten whacked. When we stopped at Lincoln Park on our way home, she grabbed a stick and barked for me to throw it. What a lucky little dog! UPDATE 13 Aug 2006: During our last Chicago visit, Jolie posed a few feet from the spot where Sophie had landed. 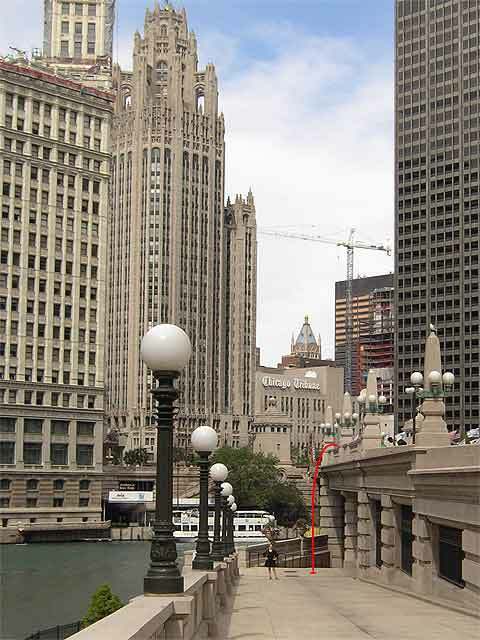 The red line shows the trajectory of Sophie's fall from Upper Wacker to Lower Wacker. Eeek. It's been a while. Faraway friends have been emailing me to find out if I'm still rolling my stone up the hill. I am. And eventually I'll get back to the La Secretaria story I promised, uh, months ago. Ironically (since I haven't actually been blogging), I talked briefly about blogging at the UIUC Webmasters Forum yesterday – I joined Joe Grohens and Jack Brighton for Blogs, Wikis, and RSS Feeds. We had a lot to cover, and unfortunately I didn't get to the thing I'm most buzzed about this week: moblogging. While setting up a practice demo at blogger.com, I discovered that I can post photos from my camera phone to a free blogger.com blog using the mail-to-blogger address found under "Email" in Settings. Posting the photo on my practice demo took seconds, literally. I added the title and text later. Hmmm... I'm going to have to add a column here just for phone photos!